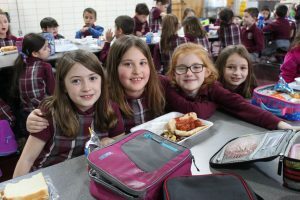 A breakfast item and hot lunch will be available daily to every student at St. Francis Xavier School, at no charge. Our school district was selected to participate in a new federal program that eliminates all meal fees, regardless of family income levels. This program was designed to serve more nutritious meals and save families money. Under the new federal program, “Community Eligibility Option”, fees are waived for student breakfast and lunches. Our school lunches are provided through NB food services, and therefore our students are eligible to receive the free meals as well. PARENTS: Students will be able to select the hot lunch, or a peanut butter and jelly or meat sandwich. For your convenience, there is a link on on this page to the monthly hot lunch menu. Teachers will be surveying students each morning and sending a daily count following morning announcements to the lunch room. Each of these selections includes a free milk (please note: plain milk only) or water, however, if your child is not planning on having a provided lunch, the cost of milk will be 50 cents and any extra lunch portion will be $1.00. The opportunity to receive a free breakfast item, will take place from 7:45-8:00am daily. If your child is planning on taking advantage of the free breakfast program, he or she should arrive to school during this window and have breakfast before heading to the classrooms at 8:05am. We thank you in advance for your cooperation. Please note: Due to kitchen and time constraints, some warm breakfasts listed on the menu will be substituted with a cold breakfast option.